Weekend EFL tips for Saturday afternoon’s crucial fixture list. We’ve picked out three selections from League One and League Two, and we’ve included the reasons for each pick and a £40 sign-up bonus to spend on the action. We’re using William Hill to bet on these EFL football tips and if you open an account with them on your mobile, you will qualify for their bet £10 get £30 offer. The first of our EFL betting tips comes from the Keepmoat Stadium where Doncaster host Plymouth. Donny occupy the final play-off spot, but they can’t afford to take their foot off the gas just yet with Posh, Coventry and Blackpool chasing them down. Grant McCann’s men have exceeded expectations this season, and they can match any side in South Yorkshire. Their home record is outstanding, with just two defeats from twenty games so far this season. They’ve also won eleven times here, and recently avoided defeat against in-form Charlton, and high-flying Barnsley. They are the fourth highest goalscorers in the league, having netted more than both Barnsley and Charlton, and only Luton have scored more goals on their own patch this campaign. On the contrary, Plymouth have averaged less than a goal a game on the road with just 19 goals in 20 away trips so far. The Pilgrims are not without their dangers, and have a number of tricky players to keep an eye on. However, they’ve only won twice since February 9th, and away from home, they’ve only won four times. Three of those four victories came against sides currently in a relegation scrap (Southend, Scunthorpe and Rochdale). Plymouth held their hosts a 1-1 draw here last season, but this Donny outfit is unrecognisable from last season’s middling side, and they’ve netted seven goals in their last two home matches. They should be too strong. The second of our EFL predictions comes from League Two with Forest Green hosting Macclesfield. Macc were 3-2 winners in midweek against Exeter, and despite problems with finances, they are clearly fighting for the cause and for Sol Campbell. The Silkmen have found the net in eight of their last nine away games, and it’s rare that they fail to trouble the opposition goalkeeper. With Elliott Durrell back in the side, they have some much needed creativity and flair, and Harry Smith has found his shooting boots in recent weeks as well. This won’t be easy, as FGR are very much in a battle for the play-off spots, but Mark Cooper’s side don’t keep many clean sheets. Only five teams, including low-scoring Crawley have failed to find the net at this ground, but on current form, Macc should have enough about them. They recently found the net at Sincil Bank and at Field Mill, and I think they can score here. I was surprised to see BTTS? Yes such a chunky price here, but I’m more than happy to snap it up. Read More: See today’s best Both Teams to Score betting tips for Saturday afternoon. It’s been a topsy-turvy season for both of these clubs, and this is a huge relegation battle. The Red Devils have completely fallen apart in the second half of the campaign, and Gabriele Cioffi’s position must be under immense scrutiny by now. Crawley are the lowest away scorers in the division with just 11 to their name, and they haven’t notched more than 1 goal on the road all season. Yeovil aren’t exactly flourishing either, but they have beaten Cambridge and Morecambe here in Somerset, with Notts County and Stevenage the other victims. However, they put in a hugely spirited performance against Swindon, and deservedly nicked a late equaliser. Alex Pattison and Sassy D’Almeida return to the squad, and should provide some extra competition for interim manager Neale Marmon to choose from. There is a spirit about Yeovil, whioch seems to be missing in the Crawley squad. They’ve netted just once in their last four away games, and I think they’re worth opposing here. Crawley have lost each of their trips to bottom seven opposition this season, and three of Yeovil’s four home victories have come against sides in and around them in the League Two table. 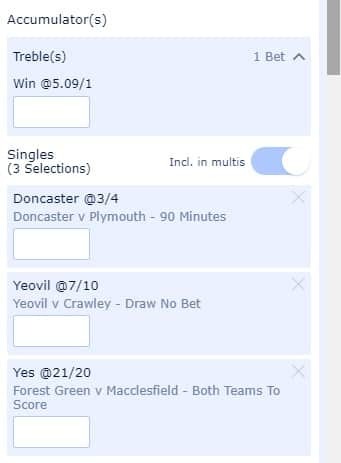 Because we can’t trust the Glovers on the outright, the third of our EFL betting tips is Yeovil Draw No Bet. Read More: Take a look at our Championship betting tips for this weekend’s action. If you open a new William Hill account to bet on this weekend’s football tips, you will get THREE free £10 bets once you bet £10 on this or any bet.